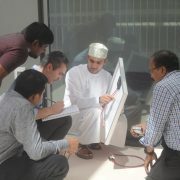 A Solar Photovoltaic (PV) Course was held at the German University of Technology in Oman (GUtech) last week. 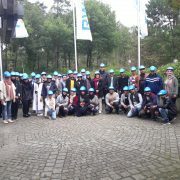 Over 20-participants from industry, SMEs and academia attended the 5 day course. The course was conducted for the third time at GUtech by Shams Global Solutions (SGS) in partnership with Solar Energy International (SEI). Throughout the week of training, participants got a solid understanding of various components of solar PV systems, including system components, design, installation and maintenance of these systems. Oman’s Distribution Code Review Panel (DCRP) officially certifies the course in support of individuals who want to become licensed Junior or Senior Solar Experts. The development of the course, along with the hands-on outdoor training facility located at GUtech, has been sponsored by BP Oman. Shell Oman, together with GUtech and Caledonian College of Engineering signed an ‘Agreement of Commitment’ for the institutions’ participation in next year’s Shell Eco-marathon, one of the worlds’ leading energy efficiency competition. 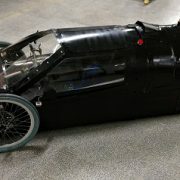 The competition requires engineering students from around the world to design, engineer, and build energy efficient vehicles to be tested during the Eco-marathon, determining whose vehicle can go the distance on limited amounts of fuel. 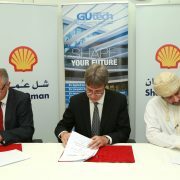 GUtech Professor and Deputy Rector for Academic Affairs, Dr. Armin Eberlein, Caledonian Professor Dr. Ahmed Hassan Al-Bulushi, Shell’s Country Chairman in Oman Chris Breeze, and Shell Oman Marketing Company CEO Mohammed Mahmood Al Balushi all signed the agreement. Students compete with over 100 students from nearly 20 countries throughout Asia and the Middle East. Participants take their vehicles to the track in the Mileage Challenge to see which vehicle can compete to go the farthest on the least amount of fuel. In preparation of the competition, students are challenged to design, build and test energy-efficient cars, pushing the boundaries of what is technically possible. “We are privileged to have Shell’s support for GUtech’s participation in the Shell Eco-marathon over the past 5 years. The program has made a significant impact to our teams, allowing us to refine and improve our designs from year to year. As a result, we were the best team from Oman in last year’s Eco-marathon Asia, achieving 3rd place amongst the Diesel engines,” said Dr. Armin Eberlein. 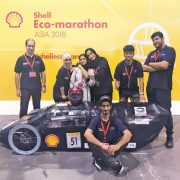 The 2019 Shell Eco-marathon will be GUtech’s 5th consecutive year and Caledonians 3rd year to participate. In 2015 the GUtech team was the first team from Oman to participate in the final competition in Manila, they were fifth in the diesel category. In 2018, GUtech finished taking third place in the prototype diesel category and a commendable 17th place out of 30 in the prototype internal combustion class. Halban A five-day solar photovoltaic course was held at the German University of Technology in Oman (GUtech) last week. Oman’s Distribution Code Review Panel (DCRP) officially certified this technical training course. Over twenty participants from the industry, energy distribution companies and the academia (including Engineering professors from GUtech) were enrolled in the course. The course was one of four different courses currently offered by Shams Global Solutions (SGS), in partnership with Solar Energy International (SEI). “Through our course, we are aiming to fulfil the objective of preparing locals to take up important roles in the renewable energy sector. The Shams training programme covers fundamental aspects that enhance the knowledge and capabilities of individuals and professionals,” said Dr. Firas Al-Abduwani, Co-Founder of Shams Global Solutions. “The course gave us a strong introduction into the design and installation of solar photovoltaic power systems, including how to conduct solar site analyses, to understand equipment specifications, to correct cabling and mounting requirements, as well as the inverter selection, the interface protection and safety. 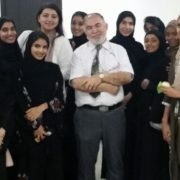 We are looking forward to the other three courses SGS is offering in Oman,” said Ali Al Humairi, Lecturer in the Department of Computer Sciences at GUtech. 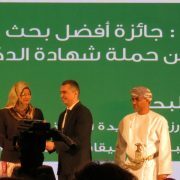 “It is a pleasant moment to see that we have realized the project and to offer the first professional solar training in Oman. The success of the training can be noticed from the motivation of the participants who have showed their interest to join our other training levels in the near future. The class was full and we have got many applications for the upcoming training. It is our honour to be one of the first participants in the capacity building of Oman in Renewable Energy Field,” said Prof. Dr. Najah Al Mhanna, Head of the Engineering Department at GUtech. In addition, the PV101 course, SGS will provide lab/field-based courses and advanced theory courses on grid-tied photovoltaic systems. 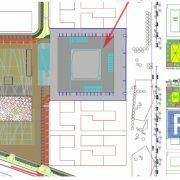 Just recently they broke ground and started construction on a nine kW outdoors training facility at GUtech that is being sponsored by BP Oman. HALBAN The GUtech team ‘Megalodon’ has successfully completed the Shell Eco-marathon Asia in Singapore last Sunday. With a final result of 118.7km for one litre the GUtech team achieved the 3rd place in the diesel category, behind universities from Japan and the Philippines. The team also ranked 17th out of 30 in the Internal Combustion Engine (prototype ICE). Their challenge was to drive as long as possible while using only 1 litre of diesel fuel. “Overall, we achieved all that we had aimed for, which were to pass inspection and get a few runs on track. Our final attempt recorded 118.7km per litre was okay for us,” said Neeraj Krishnan, Mechanical Engineering student and the team leader. The GUtech team was the only participating team from Oman after the team from Sultan Qaboos University (SQU) had pulled out their participation. Initially, the Megalodon team passed all technical inspections. The weight of the vehicle was 75kg without the driver Iman Al Maawali. The female GUtech Process Engineering student drove the GUtech eco-friendly car. “The student team lead by Neeraj have done a great job and largely improved the efficiency of the vehicle compared to previous years,” said Prof. Dr. Emmanouil Bouzakis, Assistant Professor at the Department of Mechanical Engineering at GUtech. The material for the body of the car used was different than last year but with the same diesel engine. The Megalodon team was sponsored by Shell Oman and GUtech. HALBAN Six GUtech Engineering students of the team ‘Megalodon’ are currently preparing for the Asia Shell Eco-marathon to take place next week in Singapore. The GUtech students hope that their ideas and inventions can contribute to building lighter and eco-friendlier cars in future. Their newly developed car was shipped to Singapore a few days ago. Prior to the departure, the team members and their advising Engineering professor had time to speak about their month-long preparations and the special driving strategy that they will apply. The whole team started the project in November. For the second time an Omani female GUtech Process Engineering student, Iman Al Maawali, will drive the eco-friendly car. As in previous years the GUtech team will compete in the category prototype diesel, against more than 100 other student teams. Their challenge will be to drive as long as possible while using only 1 l of diesel. 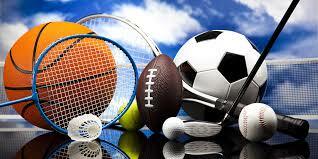 “It is a great experience for us. I learnt more about building a car and how to improve its efficiency,” said 3rd year Process Engineering student Al Jaziya Al Nazwani, who worked long hours along with her team colleagues. She added: “I would like to work with Shell in future. The Eco-marathon is a good opportunity for us to learn more about Mechanical Engineering.” She was involved in manufacturing the chassis, the body of the car and the steering system. The material of the body and chassis is aluminium and carbon fibre. The GUtech team including three female students will participate for the fourth time in the Asian competition that was held in Singapore and Manila in previous years. Compared to the past years many features were improved. Dr. Emmanouil Bouzakis of the Engineering Department supervised and advised the team during their preparation for the Eco-Marathon. The GUtech Eco-marathon team is sponsored by Shell Oman and GUtech.